This exhibition covers two bodies of work: paper-based alternative toy and watercolor painting on coaster. The artist, Hehe, call it ‘a trivial art’. What audience sees in this exhibition is his playground. In social context, he tries to show his concern of the floating mass where people are put into a situation when they cannot really act or react. This is the first edition of Lir’s “New Work Presentation”, exhibiting emerging artists’ work in progress. Pameran ini terdiri dari dua badan karya: mainan yang terbuat dari kertas dan lukisan cat air di atas tatakan gelas. Senimannya, Hehe, menyebut karyanya sebagai ‘seni remeh-temeh’. Apa yang dilihat oleh pengunjung adalah taman bermainnya. Dalam konteks sosial, ia mencoba menggambarkan kegelisahannya atas masa yang mengambang, di mana orang-orang diletakkan pada posisi yang tidak memungkinkan untuk bertindak atau bereaksi. Ini adalah edisi pertama “New Work Presentation” yang diisiniasi Lir untuk memamerkan karya setengah jadi dari para emerging artist. Once upon a time in a peaceful land far far away, live a colony of colorful escapist that looks like little cubes and tubes. Every day, they will walk down the road, talking to each other, and sightseeing. They run, they talk, they hide, they love, but- alas! They don't make and do for they have no hand. But they are happily believe that who needs hand anyway when you are blessed with extra eyes at the back of your head to seek more beauty; or some extra head to make better consideration; or perhaps, some extra legs to run down the prairie? From a city of the escapist colony, we take a crowd of the happiest creature and display it here. 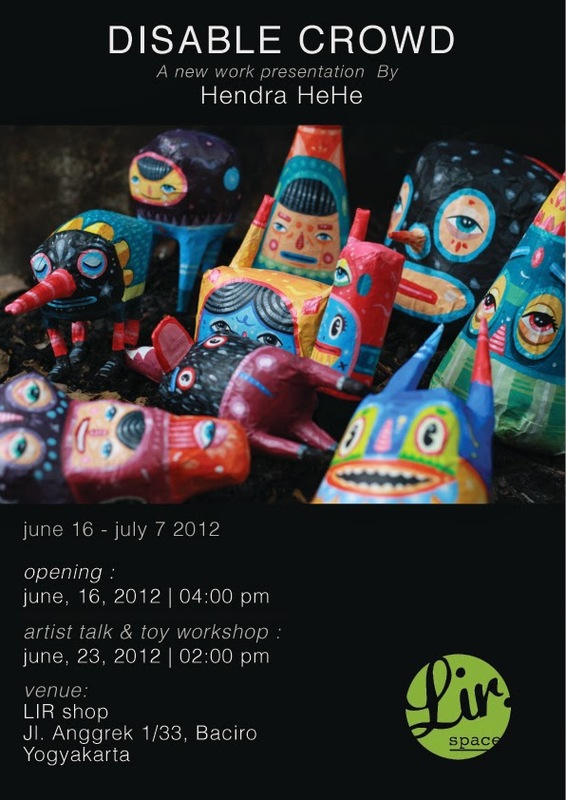 This exhibition covers two bodies of work: paper-based alternative toy and watercolor painting on coaster. The artist, Hehe, call it ‘a trivial art’. They are trivial because Hehe was actually having fun playing with them; mold them into basic forms creature, comic style. It is more like the less serious version of paper sculpture in the form of alternative urban toy. Once again, unlike the typical plastic-culture urban toy made from resin or vinyl, Hehe made the plushie using papier-mâché technique. The same unwind process was done spontaneously for the watercolor drawing. Perhaps the artist saw the new blank beer coaster scattered around his house, and this idea comes in his mind to draw on it and voila! Drawing it is... as easy as one two three. But for an artist like Hehe, the seemingly unserious process of making his art is after all done with careful consideration. As a busy up-and-coming young artist, Hehe admits that he needs this kind of art. There are different sensation between painting on canvas and making these trivial works like this. The process was all spontaneous and accidental; expressing the deepest feeling of the artist himself. Somewhere deep inside him lays this mixed emotion and characters that can be seen through his art. What audience sees in this exhibition is his playground. In Hehe’s work, his personal life and social concern are attached in harmony. Buried deep inside his consciousness, his personal role as a young father has transformed the shape of his art work from a single figure character to double or even triple characters; either in two-face form at the front and the back of the creature; or three faces in stack shape. His choice of stacking the heads shows his male-role in his domestic life with all of his responsibility. Instinctively, he starts creating non-single creature ever since he got married and blessed with a child. But even with that male-role symbol he creates, Hehe didn’t mean to point a specific gender for his creature. Just like Indian God and Goddess who are portrayed genderless: these creatures could be a male, a female, or even both. In social context, he tries to show his concern of the floating mass where people are put into a situation when they cannot really act or react. Hehe creates no hand for the creature and in exchange, he put up more than two eyes, legs, big funny mouth, and ears. They can think, take a look around from different point of views, runaway from the situation and speak out loud; but they simply can’t ‘do’. The word ‘disable’ in the title is based upon the technological term ‘disable’ where certain ability of the gadget is muted by the controller. Their eyes lost the glimmering ambition, dream, and some of them lost the twinkling sparkle of hope in their eyes. But don’t get me wrong; no matter how desperate they look like, they are a happy crowd in the most humble wish. This condition of counting the blessing while they marginalize the dream and ambition down below is well known as a wisdom of having just enough of everything; are very common in Indonesian society, especially in the lower social class who was given no choice nor even knowing that there is certain option of life available. There is actually a term in Javanese to describe this condition, ‘sumeleh’, which could be roughly translated as reconcile to whatever condition given to him happily in the more laid-back manner. More than that, it’s about living a harmonious life between the ideal and the reality. The line between whether they are actually lightly floating through the world and whether they don’t have much choice is very thin. In one way to another, it’s funny how opposed from the toy figures; his drawing portrays some characters with two or more hands. Later, the drawing could be perceived as the ideal situation dreamt by the crowd; with two or more hands to actually ‘do’ things and starry hopeful eyes, they are picture perfect. At the end, the portray of reality and ideals given in these two bodies of work blends together in this exhibition; provide a chance to take a reflective view of our current social condition or personal issue. Of course, there is always another option to take Hehe’s work lightly, merely by adoring the cuteness of the characters- just as easy as the way he made it all at the very first time: by having fun! Pada suatu hari di negeri yang damai nun jauh di sana, hiduplah sekumpulan makhluk warna-warni yang terlihat seperti kubus dan tabung kecil. Setiap hari mereka berjalan-jalan di negerinya yang tenang, saling bercakap-cakap, dan melihat-lihat pemandangan. Mereka berlari, berbicara, bersembunyi, mencintai, tapi sayangnya; mereka tidak membuat, bekerja, ataupun melakukan sesuatu karena mereka tidak memiliki tangan. Mereka percaya bahwa mereka tidak membutuhkan tangan karena mereka dikaruniai dengan mata yang lebih dari dua untuk mencari lebih banyak keindahan, kepala yang lebih dari satu untuk membuat keputusan yang lebih baik, dan beberapa memiliki kaki ekstra untuk berlarian di padang rumput. Dari sebuah kota berisi koloni para pelarian ini lah kami mengambil segerombolan makhluk paling bahagia dan menampilkannya di sini. Pameran ini terdiri dari dua bentuk karya: urban toy yang terbuat dari kertas dan lukisan cat air yang dibuat di atas tatakan gelas. Seniman pembuatnya, Hendra “Hehe”, menyebutnya “seni remeh temeh’. Dianggap remeh temeh karena dalam pembuatannya, Hehe banyak bermain-main dan bersenang-senang dalam membuat karya-karya tersebut; dia membuatnya dari bentuk dasar seperti kotak, segitiga, bulat, dan dengan gaya yang komikal. Mainan-mainan ini merupakan versi tidak terlalu serius dari patung kertas dalam bentuk alternative urban toy. Sekali lagi, tidak seperti urban-toy pada umumnya yang merupakan bagian dari plastic culture, alih-alih dibuat dari resin atau vinyl, mainan ini dibuat dengan tehnik bubur kertas. Proses yang sama santainya dilakukan secara spontan dalam pembuatan gambar dengan cat air di atas tatakan gelas. Mungkin si seniman begitu saja menemukan tatakan bir baru yang kosong bertebaran di rumahnya ketika ia memutuskan untuk melukisnya dengan cat air, begitu saja. Namun bagi seniman seperti Hendra Hehe, proses yang tampaknya tidak serius dalam pembuatan karya seni tetap saja dilakukan dengan perhitungan yang hati-hati. Sebagai seniman muda yang sibuk, Hehe merasa membutuhkan seni remeh-temeh semacam ini. Baginya, terdapat sensasi yang berbeda antara menggambar di atas kanvas dan bersenang-senang dengan seni remeh-temeh ini. Prosesnya yang jauh lebih spontan mampu mengekspresikan emosi terdalam si seniman. Jauh di dalam dirinya terdapat gabungan emosi dan karakter yang mampu digambarkan dalam karyanya. Yang kemudian dilihat oleh pengunjung pameran ini adalah ruang bermain sang seniman itu sendiri. Dalam karya-karya Hehe, baik kehidupan personal maupun kepeduliannya terhadap konteks-konteks sosial tergabung dengan baik. Di bawah alam sadarnya, perannya sebagai ayah muda telah mengubah bentuk karyanya yang semula merupakan figur tunggal menjadi figur jamak. Beberapa memiliki dua muka yang tergabung di atas-bawah atau depan-belakang; lainnya merupakan tiga muka yang bertumpukan. Pilihan menumpuk muka-muka ini memperlihatkan perannya sebagai pria dalam keluarga dengan segala tanggungjawabnya. Secara naluriah, ia menciptakan figure-figur jamak ini sejak mulai menikah dan dikaruniai seorang putra. Walaupun karyanya menggambarkan symbol-simbol peranan pria, namun Hehe tidak pernah bermaksud menggambarkan gender tertentu untuk makhluk-makhluknya. Seperti halnya dengan sosok Dewa Dewi di India yang digambarkan tidak memiliki gender yang jelas, makhluk-makhluk ini pun bisa menjadi pria, wanita, atau kedua-duanya sekaligus. Dalam konteks sosial, dia mencoba menggambarkan keresahannya atas massa yang mengambang di mana orang-orang diletakkan dalam sotuasi tanpa daya di mana mereka tidak bisa benar-benar berbuat sesuatu. Hehe menciptakan makhluk tanpa tangan dan sebagai gantinya, ia meletakkan mata dan kaki yang berlebih, mulut besar yang lucu, dan beberapa memiliki telinga. Mereka mampu berpikir, melihat dengan berbagai sudut pandang, melarikan diri dari situasi yang tidak nyaman, dan berbicara; namun mereka tidak mampu berbuat sesuatu. Kata ‘disable’ dalam judul pameran ini pun merujuk pada istilah ‘melumpuhkan’ yang biasa terdapat pada alat-alat tehnologi yang sengaja di non-aktifkan oleh kekuasaan yang lebih besar. Maka tidak heran bahwa mata-mata makhluk ini kehilangan sinar ambisi, mimpi, dan sebagian bahkan kehilangan kerlip harapan di dalamnya. Tapi jangan salah, walaupun mereka terlihat sedikit memprihatinkan, namun mereka adalah segerombolan makhluk yang berbahagia dengan cara yang sederhana. Kondisi ini di mana mereka mampu bersyukur terhadap keadaan sementara mengesampingkan mimpi dan ambisi, merupakan sebuah kebijaksanaan atas perasaan ‘cukup’ atas segala sesuatu. Hal ini merupakan hal yang normal dalam kondisi sosial Indonesia, terutama dalam kelas bawah yang tidak diberikan pilihan maupun tidak akrab dan tidak mengerti bahwa ada pilihan hidup lain selain yang mereka tahu. Dalam istilah bahasa Jawa, hal ini digambarkan dengan kata ‘sumeleh’ yang merupakan kondisi menerima apapun yang diberikan secara ikhlas dan senang hati. Sumeleh merupakan kondisi harmonis yang berada di antara keinginan dan realita. Tipis perbedaan antara apakah mereka benar-benar dengan ringan mengambang di dunia tanpa aksi ini atau mereka tidak memiliki pilihan. Berlawanan dengan sosok mainan tanpa tangan yang dibuatnya, gambar-gambar di atas tatakan gelas itu melukiskan beberapa karakter yang memiliki dua tangan atau lebih. Pada akhirnya, lukisan-lukisan kecil ini bisa diartikan sebagai gambaran ideal yang diimpikan gerombolan ini. Dengan adanya dua tangan atau lebih mereka bisa benar-benar memiliki kemampuan untuk melakukan sesuatu dan juga memiliki mata yang penuh harapan. Pada akhirnya, gambaran realitas dan ideal yang diberikan oleh dua jenis karya seni ini menyatu dalam pameran ini; memberikan kesempatan untuk berkaca mengenai kondisi sosial saat ini maupun isu-isu personal. Namun tentu saja, kita selalu memiliki pilihan untuk menyikapi karya Hehe dengan lebih santai dengan begitu saja mengagumi kelucuan karyanya- semudah proses pembuatannya: dengan bersenang-senang! -Could you share a story about your creativity so far? +Usually I get it from many kinds of reference from media (magazines, books, films, clip videos, interesting sites in internet, fine art exhibition, and daydreaming). Then I get am idea, sketching, choosing the proper media, and artwork execution. -In your blog, you said that you like paintings, drawings, and art toys. What is the reason of doing the art through those media? +There is no more fantastic things except doing what we like. It did not only stop with the happy feeling but also convey our ideas through artworks with the proper language. -What about the process preparing the Disable Crowd exhibition at Lir? +Casually, I know Dito and Mira. Sometimes I visit the opening exhibition at Lir space, I posed an offer to hold a paper statue exhibition, and they agreed. The preparation was last two months efficiently. -The exhibition was crowned Disable Crowd, what is the reason? Moreover, Disable Crowd is also described as a new work presentation by Hendra Hehe. Could you explain the meaning? +Disable Crowd is a picture of condition where we are the member of the wider community; undergo uncomfortable situations, and the uncomfortable feeling derived from things made surpassing our capability. New work presentation means that just this time I explore the new media (paper statue with papermache technique) and it was exhibited. That exhibition embodies artist presentation of artwork publishing. -What is the reason choosing Lir as the exhibition space? +I am interested in a small space and in my opinion, at Lir I can play around with my artworks. -Does Lir give something good to your creativity? Could you mention it? +Hmmm, yap, sometimes the spirit of playing in alternative rooms such as Lit is important for me besides holding exhibitions in commercial gallery. We can learn the responds from other audiences. -What will you do after having exhibition at Lir? Could you tell us a bit of your next projects? +After this I will keep processing through artwork, technically or based on idea. My next projects are I wish I could make much more exhibition, hihi. 1) Bisa berbagi cerita tentang proses kreatif mas selama ini? Biasanya dari lihat referensi di berbagai media (majalah, buku, film, video klip, situs menarik di internet, pameran pameran senirupa,dan ngelamun)…dapet ide….sketsa…pemilihan medium yang cocok….eksekusi karya. 2) Di blog mas Hehe, mas mengatakan bahwa mas menyukai lukisan, drawing, dan art toys. Alasan berkesenian melalui medium-medium itu apa? Tidak ada yang lebih menyenangkan dari melakukan apa yang kita sukai :-). tetapi tidak berhenti dengan rasa senang saja, saya percaya bahwa setiap medium itu punya bahasa, jadi saya sebagai seniman harus bisa menyampaikan ide melalui karya dengan bahasa yang sesuai. 3) Bagaimana proses menyiapkan pameran Disable Crowd di Lir? Kebetulan saya kenal dengan Dito dan Mira…beberapa kali datang ke acara pembukaan pameran di LIR space, saya mengajukan penawaran mau bikin pameran patung kertas dan mereka setuju. Persiapan karya efisien 2 bulan. 4) Pamerannya diberi tajuk Disable Crowd, alasannya apa? Oiya, Disable Crowd juga dideskripsikan sebagai a new work presentation by Hendra Hehe. Bisa dijelaskan maksudnya? Disable crowd itu gambaran kondisi dimana kita sebagai bagian dalam komunitas yang lebih luas, mengalami hal-hal yang tidak nyaman, dan rasa tidak nyaman itu berasal dari hal-hal yang dibikin dan di luar kemampuan kita. New work presentation maksudnya karena baru kali ini saya eskplor medium baru (patung kertas dengan teknik paper mache) dan dipamerkan. Pameran itu bentuk presentasi seniman atas karya ke publik. 6) Apa alasan memilih Lir sebagai tempat berpameran? Saya tertarik dengan ruangan yang kecil dan menurut saya di LIR saya bisa bermain-main dengan karya saya. 7) Apakah pameran di Lir memberikan sesuatu ke dalam proses berkesenian mas Hehe sendiri? Jika ya, apa sesuatu itu? Hhhmm iya…kadang semangat “bermain” di ruang-ruang alternative semacam LIR perlu bagi saya selain membuat pameran-pameran di galeri komersil. Kita bisa mengetahui respon dari audience yang lain. 8) Apa yang dilakukan setelah berpameran di Lir? Bisa ceritakan sedikit tentang rencana proyek-proyek mas Hehe ke depan? Setelah pameran di LIR masih tetap berproses melalui karya.Secara teknis maupun ide. Proyek-proyek ke depan, semoga makin banyak pameran, hehhe.